Synopsis: A couple begin to experience terrifying supernatural occurrences involving a vintage doll shortly after their home is invaded by satanic cultists. Review: There’s just something so unsettling about dolls, isn’t there? I’m not talking about Malibu Barbie or He-Man but those frilly dolls with big eyes and faces stuck in permanent, and often pained, smiles. Creepy dolls have been the subject for many a nightmare in movies, most memorably in films like Magic (a ventriloquist dummy plays a devious role in murder) and Child’s Play (the spirit of a serial killer takes the form of a benign doll) but everyone seems to have some film they can point to where something meant for snuggling winds up being deadly. In 2013 The Conjuring made a big impact with critics and audiences (not to mention at the box office) thanks to director James Wan’s clever turning of the screws as he told the tale of a family haunted by an ominous spirit in the early 70s. The family was aided by two paranormal investigators, The Warrens, introduced at the beginning of the film handling the Annabelle case. Supposedly causing mayhem for two pretty nurses, The Warrens wind up keeping the doll (Annabelle) in their Occult Museum where they can keep an eye on her. Though she figures into some events later in the movie, Annabelle isn’t really the focus of the film. 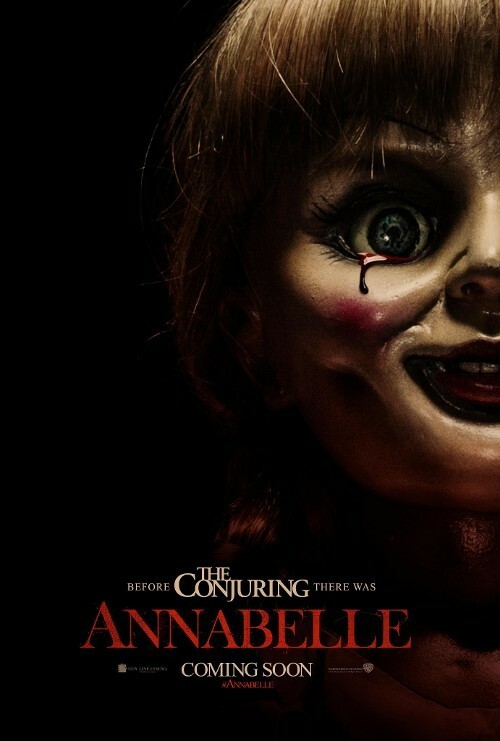 With the box office so big, the sequel ideas started flowing and the filmmakers wisely let their minds drift not just to continuing to follow The Warrens (a sequel is expected in 2015) but creating a spin-off centered on the origins of Annabelle. So that’s why we find ourselves a little over a year later with this sequel which maintains the same fine production values of The Conjuring while delivering some fine frights but which unravels just when it should all be coming together. It’s the time of the Manson Family in California when we meet young couple Mia (Annabelle Wallis, Snow White and the Huntsman), and John (Ward Horton, The Wolf of Wall Street) who are the picture of blissful perfection in their sleepy suburban bungalow. She’s quite pregnant and content to spend her days watching soaps and sewing while he finishes up his residency as a doctor. Mia (the first of many nods to Rosemary’s Baby) also collects dolls and after a minor squabble John’s mea culpa present to her is a familiar looking doll. Unfortunately, the first big scare sequence in the film was largely given over in its entirety in the preview yet I still found myself squirming with a sense of dread. Long story short, after a terrifying nighttime encounter in which the doll plays a factor things start to get pretty scary for John and Mia, prompting their move to a high rise apartment building where they have more square footage to get freaked out in. It isn’t long before more strange occurrences happen leading to the true terror manifesting itself at the most inopportune of times. All this is well and good and it gave me the appropriate dose of the willies but the movie starts to collapse in on itself at a rapid pace becoming highly disappointing in the process. John Leonetti, the cinematographer of The Conjuring steps into the director chair here but doesn’t have Wan’s good instincts in knowing how to bring all of the elements together. We can only have so many shots of the camera slowly pushing in on the doll’s face (which gets dirtier and more menacing with each passing event) or following Wallis as she slowly walks down a hall or sloooooowly reaches out to move a curtain aside to see what’s behind it. The key word here is slow. There’s a lot of repetition going on in the film and in the end Annabelle is merely a series of the same set-up repeated on a loop. Wallis, for her part, has a nicely ethereal quality to her that helps her build to the frenzy she works herself into as we approach the finale. She and the handsome Horton make for a nice couple and the acting is above par considering this was a prequel rushed into production. I’ve always liked Alfre Woodard (12 Years a Slave) and though she may be slumming it here the actress never gives off the air that she’s an Oscar nominee in a barely realized supporting role. So it’s not everything The Conjuring was…but it’s a lot better than the majority of the sequel trash we’re subjected to year after year. Yes, it’s bloodier and less fully realized than the film that preceded it but it’s clear that some effort went into it and it’s far more effective than it probably should be considering how formulaic it all is.